There are so many amazing beauty launches out now and new ones coming every day so I thought I would narrow down the ones that interest me the most. Though that list grows by the day. Eek! 1. Louboutin mascara - I know this is ridiculously expensive, but I have been impressed so far with the Louboutin beauty launches so I am intrigued to try this. 2. Bobbi Brown Art Stick Liquid Lip - The original Art Sticks are one of my holy grail lip products, so the liquid lip launch is a must try for me! 3. YSL Shock mascara - YSL is know for their mascara, and the brush on this new launch looks like something that my lashes would love. 5. Fresh Rose Deep Hydration Toner - I love the Fresh Rose Deep Hydration moisturizer and this toner seems like the perfect addition to my skincare routine. I am a sucker for any products focused on hydration. 6. Glamglow Glowsetter - I regularly use this makeup setting spray, but it may be time to branch out to try something new. 7. Tata Harper Clarifying Spot Solution - Pesky blemish appearances are the bane of my skin existence so I was thrilled to see Tata Harper launched a spot treatment. I find her products so effective and am curious if this will follow suit. 8. Dior Addict Lacquer Stick - These full coverage lipsticks are supposed to give intense color payoff with the feel and texture of a balm. Sign me up! Now I only need to decide what shades to get. 9. Sisley Sun Glow Trio - Truth be told - the packaging is completely luring me in on this one. I love bronzer palettes that blend different colors together as they look gorgeous as cheek colors. 10. Farmacy Green Screen SPF 30 - I am already obsessed with the Farmacy brand as a whole (currently testing this new cleanser), so I was excited to see a new SPF launch for spring. 11. Aerin Garden Rose Eau de Cologne - This fragrance by Aerin was what changed my mind about rose fragrances and I began to love them. So now I am convinced she can do no wrong when it comes to rose scents and this one looks lovely. 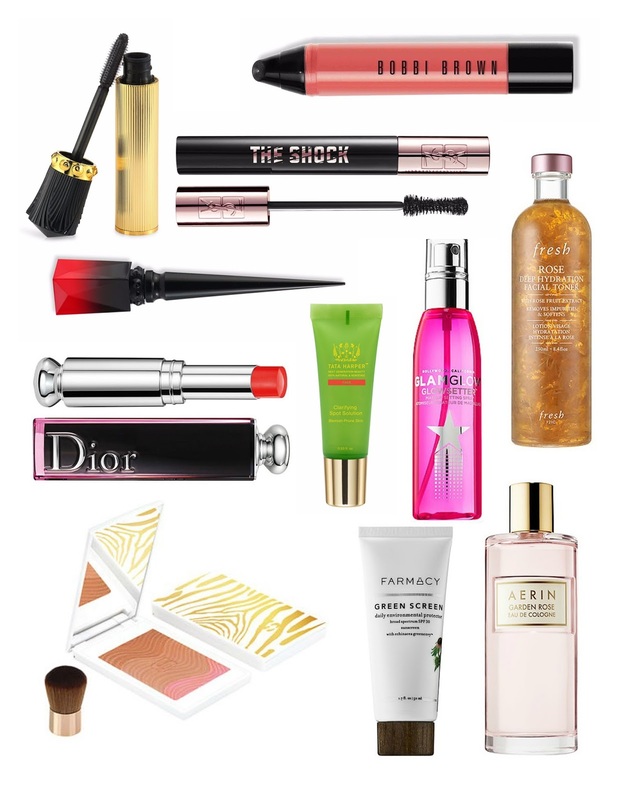 What new beauty product are you most excited to try this spring?